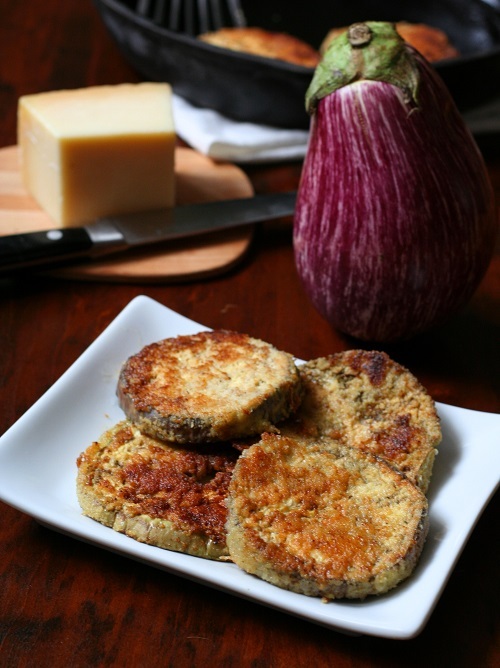 Dipped in a mixture of almond flour, garlic and parmesan, these fried eggplant slices are sure to please. Slice eggplant into ⅓ inch thick slices and arrange in a single layer. Sprinkle with salt and let sit 30 minutes. Blot eggplant dry with a paper towel. In a shallow bowl, whisk egg. In a larger bowl, whisk together almond flour, Parmesan, garlic powder, salt and pepper. In a large skillet, heat 1 to 2 tbsp butter or oil over medium heat. 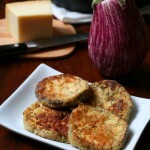 Dip each slice of eggplant in egg, shaking off excess, then dredge in almond flour mixture and shake off excess. Working in batches, arrange eggplant slices in skillet and fry until coating is browned and crisp, a few minutes per side. Remove and let drain on a paper towel lined plate. Add more oil and more eggplant slices to the pan. You may need to do 3 or even 4 batches, depending on the size of your skillet. Each serving has 10 g of carbs and 4 g of fiber. Total NET CARBS = 6 g.
I would say 2-3 slices depending on how big your slices are since eggplants vary in size.